Traveler alert: a portion of the Historic Columbia River Highway remains closed due to the Eagle Creek Fire of 2017. More information about the planned phased reopening of the highway can be found here. You’ll also find additional resources on our Travel Alerts page. My daughter, Tate, and I stand atop Chanticleer Point at Portland Women’s Forum State Scenic Viewpoint, gazing east up the Columbia River Gorge. The view is, quite simply, breathtaking. This is our first stop on a drive along the Historic Columbia River Highway from Troutdale to The Dalles. And the time is right for a tour of this old road; 2016 marked the 100th anniversary of the opening of the highway, in 1916. Hailed as the “King of Roads” and renowned for its design details and innovative construction techniques, the Columbia River Highway was everything envisioned by Sam Hill, good-roads advocate and father of the highway. This was the first major paved road in the Pacific Northwest, as well as the first designated scenic highway in the United States. And we’re eager to learn more of its history while exploring classic Columbia River Gorge attractions and taking in the jaw-dropping scenery. We leave Portland Women’s Forum, just east of Corbett, and drive along a bluff to Crown Point. 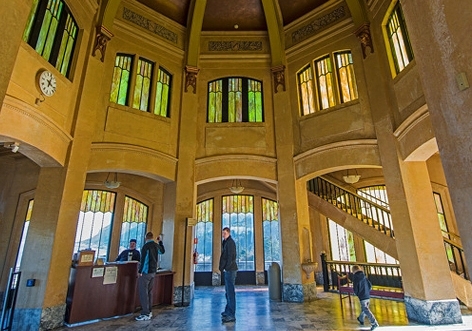 We park and take a tour of Vista House, originally built as a rest area for motorists. We spend some time in the first-floor gallery, where historic photos and panels give a detailed history of the highway. The road was nearly loved to death during its first decades, seeing far more use than was ever imagined. Then, with the construction in the 1950s of what would become I-84, many sections of the old highway were abandoned and even purposely obliterated. 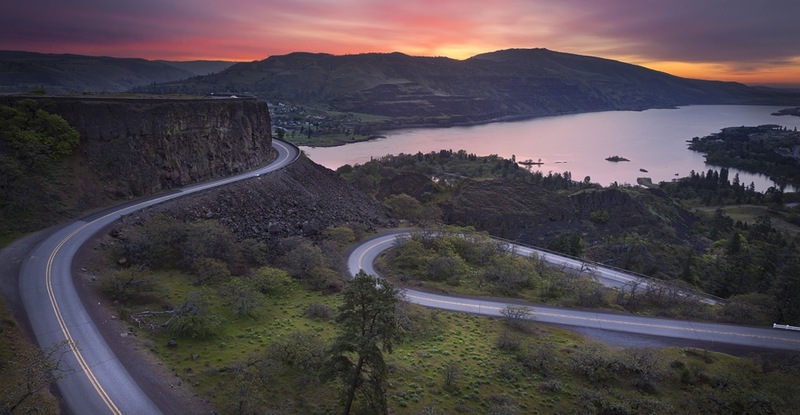 The Columbia River Gorge National Scenic Area Act of 1986 directed the state of Oregon to rehabilitate and reconnect the highway, some sections of it as drivable, others as pedestrian and bike trails. And by the official re-dedication of the Historic Highway State Trail on June 7, 2016, all but 5 miles of the original 75-mile highway were made open to either cars or pedestrians and bikes. From Vista House, it’s a steep 600-foot descent to river level, but a series of graceful figure-eight loops help to spread out the grade. 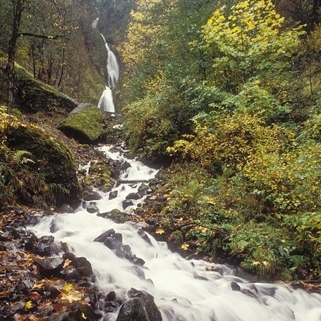 The next 5-mile stretch is known as the “waterfall corridor,” and you’ll find a variety of stunning waterfalls — one of the largest concentrations in North America — tumbling down the towering basalt cliffs. These are some of the “beauty spots” that Sam Hill wanted motorists to be able to take in up close as they drove along the scenic highway. 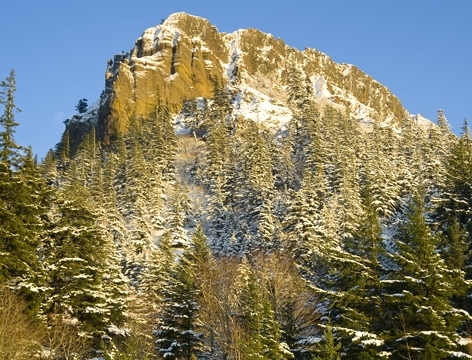 We ramble past Latourell, Shepperd’s Dell, Bridal Veil and Wahkeena falls. 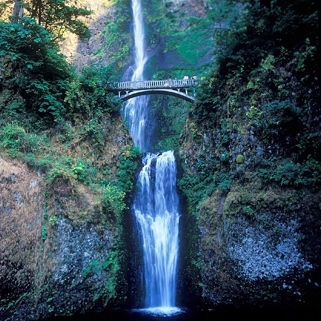 As we pass Multnomah Falls Lodge, we crane our necks to see the 620-foot falls plunging down beyond it. We continue past Horsetail Falls to John B. Yeon State Scenic Corridor, which marks the end of this drivable section of the old highway. From here, a pedestrian and bike trail continues east along the path of the old road all the way to Cascade Locks — the perfect spot for some car-free, pedal-powered exploring. For us, it’s onto I-84 for the next stretch of the road. 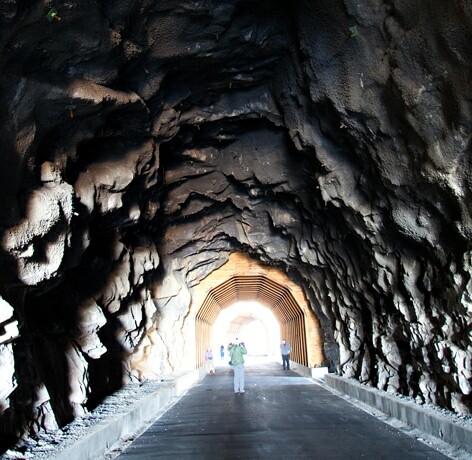 As we round Mitchell Point near Hood River, we glance up to where the old highway once stretched along the sheer basalt cliff and through the Mitchell Point Tunnel, whose famous portals allowed the light and views in. This segment is the final stretch of the old highway remaining to be restored. Fundraising and planning have begun, but completion is years away. At Hood River, our hometown, we pull off for a bite to eat at Solstice Wood Fire Café & Bar on the waterfront. Admittedly, Tate and I are no strangers here. We order our favorite: a margherita pizza and a pear-walnut salad to share. Back in the car, we head east to Mosier, where we exit I-84 and drive a half mile to the east end of the Mark O. Hatfield Trailhead, which leads to a 5-mile segment of the old highway open to pedestrians and bicycles. We walk west on the trail, past an impressive lava flow that the road was built over, and on to a stone overlook where we can see for miles up and down the river. From here it’s a stone’s throw to the Mosier Twin Tunnels. Inside, we walk into the first of two adits, or side tunnels, that lead to portals opening through the cliff wall. When the highway was built, one of the adits opened onto a stairway and “cliff walk” on the sheer rock face. Now the portals are covered with bars. The wind howls loudly as we look out on I-84 and the Columbia River hundreds of feet below, and I’m thankful the cliff walk is no longer an option. On our way out of the tunnels, we stop to read graffiti left by travelers stranded here during a snowstorm in 1921. Back at the trailhead, we climb in the car for the last section of the historic highway. A couple of miles past Mosier, we pull off at Memaloose Overlook to view its namesake island in the middle of the Columbia River. Memaloose was once a burial ground for Native Americans, who wrapped their dead and placed them in canoes or cedar vaults on the island. A few miles farther east, at Rowena Crest, we pull into the parking area at Tom McCall Preserve. Standing atop the circular viewpoint, we gaze down at the Rowena Loops below. This was another engineering feat of the highway, bringing motorists from a height of more than 700 feet gently down through basalt flows to river level. We drive down the loops and continue along the final stretch of the old highway, past the community of Rowena and on to the western edge of The Dalles. The 75 miles of the King of Roads officially ends here, but we drive through town to the Sunshine Mill Artisan Plaza & Winery. This historic flour mill, once slated for demolition, has been repurposed as a winery, tasting room and event space — with all the machinery left right where it was on the last day of the mill’s operation decades ago. We order a cheese plate and lounge on a retro orange couch, positioned beneath huge chutes and belts that were working to grind wheat into flour when the first Ford Model Ts ambled along the Columbia River Highway a hundred years ago. It’s the perfect spot to reflect on our road trip and a century-old tradition of road adventures here in the Gorge. Janet Cook is a writer and editor of The Gorge Magazine. She lives in Hood River with her husband and two kids, where she can be found windsurfing, SUPing, skiing and generally loving everything about the Columbia River Gorge.